It's official, Psy's worldwide hit "Oppa Gangnam Style" enters Guinness Book of World Records September 20, 2012 after surpassing LMFAO - Party Rock Anthem ft. Lauren Bennett, GoonRock with the most number of Likes in Youtube. 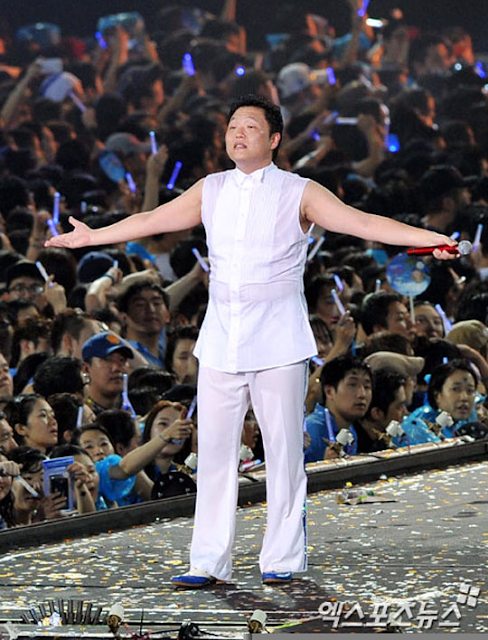 Photo: Psy, "Oppa Gangnam Style"
Psy's Gangnam Style reached 2,356,683 likes while LMFAO got 1,577,252 likes and counting. Psy’s “ Oppa Gangnam Style” has brought “Gangnam Style fever” across the world by ranking first place on iTunes in eighteen countries and exceeding 200million views on Youtube. As of this wring, total views since it was uploaded in Youtube last July 15, 2012 is 240,253,431. For sure, it will surpass total views of Carly Rae Jepsen's "Call Me Maybe" which have 240,253,431 views now.